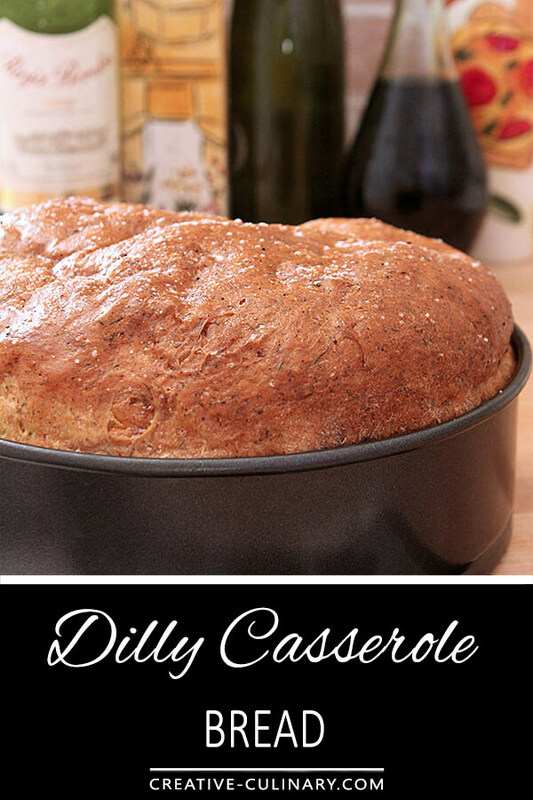 Dilly Casserole Bread is old fashioned recipe that’s a Pillsbury Bake-off prize winner from 1960. 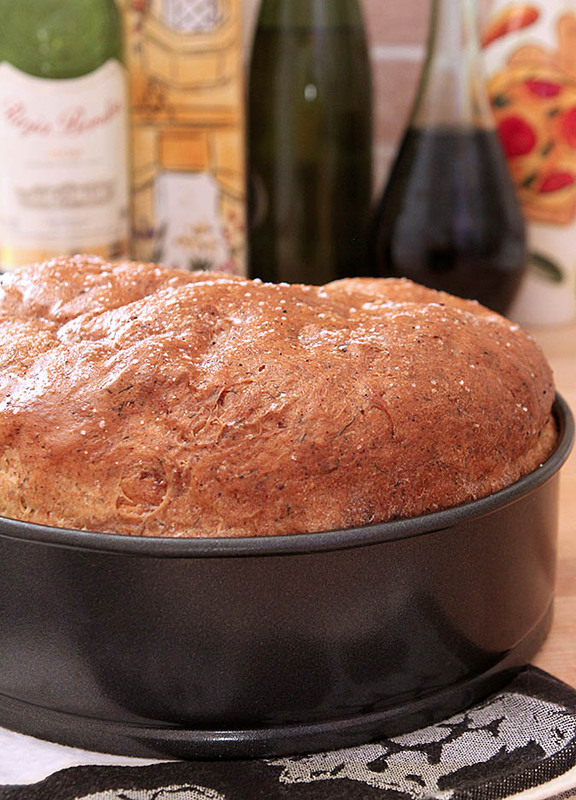 It’s stood the test of time too; this Dilly Casserole Bread is as good today as it was then. 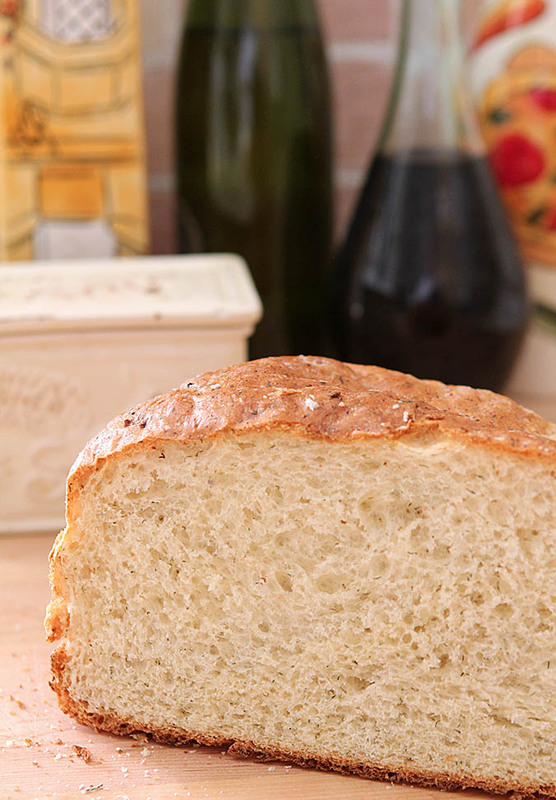 I first had this bread when we lived in North Carolina and I was invited to a friend’s home for lunch. I’ve had the recipe on this blog since 1996 when I published the recipe; nothing else. While I’m working to clean out some dead wood, I spied it and I simply could not remember where the recipe came from but I knew I had to make a loaf and share it with you. Somewhere in the back recesses of my brain I thought it might have been Southern Living Magazine; you know, one of those recipes that were sent into the publication by readers. If not it was probably from a compilation of recipes put together by a local church; those little cookbooks often held great treasures. Not really expecting to find much I did a quick Google search before writing this post and lo and behold; it’s attributed to Leona Schnuelle from Crab Orchard, Nebraska. She won the Pillsbury Bake-Off® Contest with this bread way back in 1960. It’s sort of amazing that a bread I’ve known and loved for as long as I can remember, that surely has been included in more than one of very church and community cookbooks that I mentioned, would be from this classic competition. I wonder now if any other winners have perpetrated a similar legacy…and now I’m sort of interested in finding out. For this recipe it’s apparent that the only ingredient required from Pillsbury was their flour which sure left the door open to lots of interpretation. I’m not sure I could compete adequately in the contest today where a variety of brand products are required to succeed so I’m hoping Leona was around long enough to witness how lucky she was. If you glance at the ingredients, you might be taken aback. Dried and minced onion? Small Curd Cottage Cheese? Butter or margarine? OK, I can live with the dried onion; I usually have emergency stock on hand. 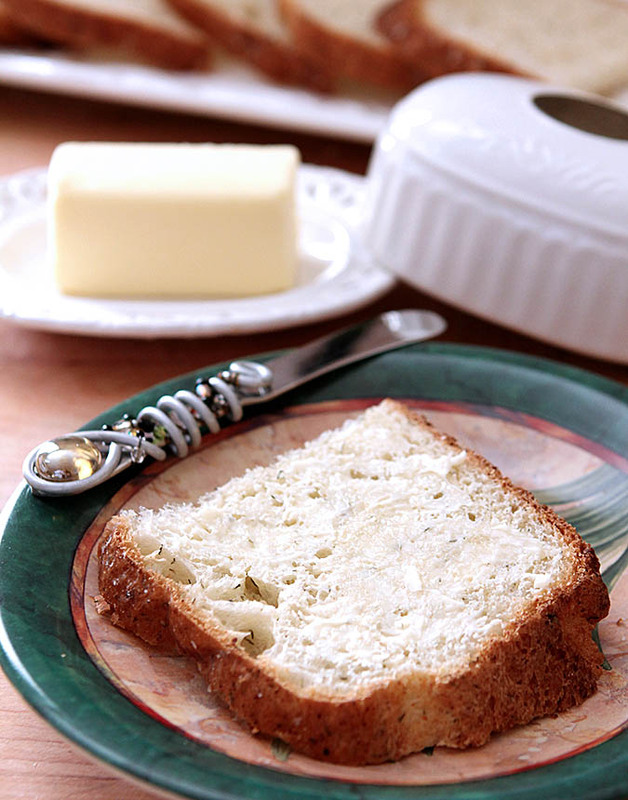 Nothing wrong with the cottage cheese; it’s not a typical bread ingredient but it really adds something special to this bread. What I changed in the recipe was a designation for butter OR margarine. I may have had margarine growing up because with our family of 8 those were the corners that were cut to keep the food budget in check. Today I don’t think it’s worth the sacrifice; it’s butter baby…all the way! I remember the first time I tried this bread at a friend’s home; I was not at all sure I would like it. The notion of combining a flavor best known for pickles with a bread seemed strange to say the least but I’m telling you the truth; left to my own devices I think I could sit and eat the entire loaf in one sitting. Those devices being a soft chair and some butter. It is really that good and I’m so glad I’ve resurrected it from the past; it was time! If you’re not sure what you’re serving with your holiday meals or summer barbecue, try something different. The flavors are subtle and delicious…I don’t think you can go wrong! In small saucepan, heat water, 1 tablespoon margarine and cottage cheese until very warm (120 to 130°F.). Add warm liquid and egg to flour mixture; blend at low speed until moistened. Beat 3 minutes at medium speed. By hand, stir in remaining 1 to 1 2/3 cups flour to form a stiff batter. Cover loosely with greased plastic wrap and cloth towel. Let rise in warm place until light and doubled in size, 45 to 60 minutes. Grease 1 1/2 or 2-quart casserole or 10" springform pan. Put a circle of parchment paper in the bottom and grease it. Stir down batter to remove all air bubbles. Turn into greased casserole or springfrom. Cover; let rise in warm place until light and doubled in size, 30 to 45 minutes. Preheat oven to 350°F. Bake 30 to 40 minutes or until loaf is deep golden brown and sounds hollow when lightly tapped. If necessary, cover with foil to prevent over-browning. Remove from casserole dish or baking pan and place on a wire rack. Brush loaf with melted margarine; sprinkle with coarse salt. Cool 15 minutes. Approximately 90 minutes in total is required for bread to rise twice. Can you use fresh dill? Sure, no problem. Dried herbs are typically more potent so you’ll want to add 2- 3 times the amount shown if using fresh. I’ve used lots of different kinds; the directions call for a ‘casserole’ and yes, I think I’ve used a round casserole dish at one time. The photos show it in a springform pan (cheesecake pan) which is 10″ in diameter but you can also make it in a cake pan if you have a large one. With any of them, I prefer greasing the bottom, cutting a piece of parchment to fit the bottom and greasing the parchment before putting the mixture in. Parchment has become something I use for all cakes and breads now; nice to know something won’t stick to the bottom! I see no one has commented on this for a year so I’ll chime in. I’ve been making this since the 1980’s and have the Pillsbury book that it was published in which tells you how old I am! (Not at home so had to look for recipe). I wouldn’t have thought dill would be good in a bread either, but it is awesome! 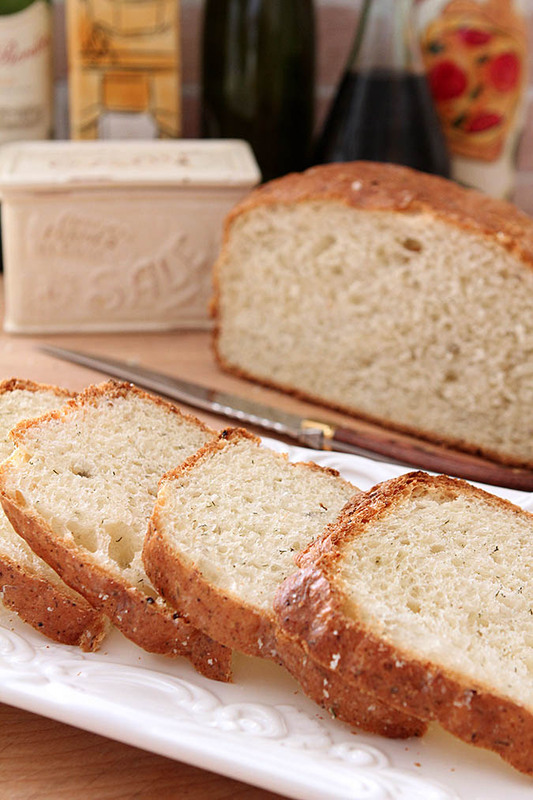 The perfect bread to go with soup or to make a sandwich out of – you won’t be disappointed! And, if you have salt flakes for the top, even better! Either way, try it and you’ll be a convert! I’m making it right now! I haven’t had this bread for many years but I never forgot how delicious it was! My Mother-in-law made this bread and always had it available for us when we visited. Such sweet memories. I have this on my to do list and today I’m off to the store to get supplies. I’m thankful you have this recipe for me to follow! I love the flavour of dill and can see that it would be delicious in bread. I also love a good batter bread and will be adding this one to my repertoire – thanks for resurrecting it Barb! This sounds delicious! And what a cool discovery to make about the bakeoff. I grew up using margarine as well when we thought it was healthier than butter. But now that we know better, I’m with you: butter all the way! I just took fresh bread out of the oven and love the smell that fills the house. I think this dill bread would be really interesting and can see why it stood out of the crowd and won the prize. Will have to give it a try! I’ve actually had dill in bread before. Not a typical flavor (in the US, at least) but it really works. Maybe it’s this recipe I’ve had, and didn’t know it! This does indeed look like a winner — thanks. OK, I am SO making this! Thanks Barb! You’re so welcome; funny how one little thing will remind us of something we love that we sort of forgot about it isn’t it? Now I have to make it too!